Davy Lees came into the room and introduced himself and somehow, I immediately felt like I knew him! He's quite simply one of the friendliest people I've ever met, and that was long before he even started singing. He stepped onto the stage and just exuded warmth and friendliness. He can sing too. He had a really lovely mix of old, weel kent songs; newer, not quite so well known yet; and a clutch of self- penned songs, and his whole manner was old fashioned in the best sense. He had the small audience in the palm of his hand and played with our emotions in a truly deep and genuinely professional way. He had us crying at "Hasta Luego" about a young lad leaving for the Spanish civil war, laughing at a fabulous Jake Thackray song, "Sister Josephine". He had rousing traditional songs like "Bonnie Dundee", a beautiful self-penned one called "The Weekend Waltz" and he had us helpless with laughter at Dead Puppies... yes, Dead Puppies! You kinda had to be there. The whole evening was utterly delightful. I'm perfectly sure that Davy will be back next year to repeat this very special treat. Without doubt Davy Lees was the star of the show! 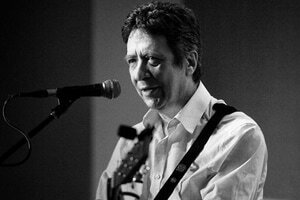 (at Leith Folk Club, red) Davy has found the perfect folk club formula, a fantastic mix of well-ken't songs, new songs, self-penned songs and lashings of humour. We laughed with him, sang with him and even shed a tear with him. Every folk club in the land should be booking Davy....because he's worth it!